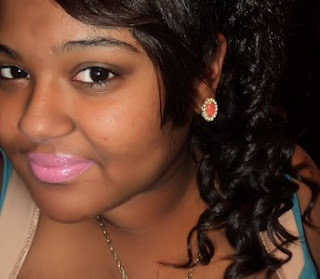 The Girly Blog | insideWYNTER: Pink Friday HOE! Sorry for my French xD. But yes, so this post is going to be my review on the Pink Friday lipstick from MAC. Retails for $14.50. Packaging was the basic black box.. I wished it was at least pink or had Nicki's signature on it. But it's not a vivi glam lipstick. *kanye shrug* . It only sold for 4 consecutive Fridays. & Sold out my like 12:10am . The lipstick was a lite, Barbie pink lipstick with blue undertones. (in my opinion). On your lips it kind of looks like a lavender lipstick in some lights. It can work for all skin tones, if you use the right lip liners**. It is also a satin lipstick, so I recommended using a good moisturizing lip balm with it..and buff your lips before using it..
Anyways on to the swatches! I actually like this lipstick, with the right lip base color, lip pencils, etc... it will fit all skin tones just like any other lipstick. Going on with no moisturizer, lip pencil, lip base, etc it looks really light Barbie pink. like PINK. Oh & I had a 2 or 3 extra ones that I was thinking about giving away, but I decided not to giveaway both. well, yeah thats pretty much it.